When you increase your plant’s reliability, you increase your production. Increase your production and you increase your company profit. 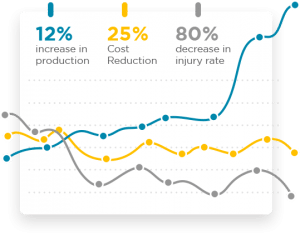 That increase in company profit is often even bigger than just the production gain, because Reliable Plants operate at lower costs. And experience shows that reliable plants are safer too. Higher reliability leads to less safety incidents. That’s why I like to say that when it comes to reliability improvement you can have your cake and eat it. But the best news? Improving plant reliability requires relatively small investments. And if done well reliability improvements offer huge returns on investment. In short, improving your plant’s reliability is one of the best investments you can make. Typical results of plants that achieve high reliability: production and profit go up, costs come down and safety improves significantly. Not to scale. Typical results of plants that achieve high reliability: production and profit go up, costs come down and safety improves significantly. There are many frameworks for reliability improvement. Most are unnecessarily complicated. The Best performing plants in the world are the Best, because they focus on the few basics that matter. Building on those basics I created a simple, yet proven framework on how to improve reliability. It’s called the Road to Reliability™ and focuses on 4 Essential Elements. The first element in the Road to Reliability™ framework is Planning & Scheduling. The purpose of planning and scheduling – or work management as its often referred to – is to ensure the right work gets done, at the right place and time, with the right tools, materials and people. Getting Planning & Scheduling in place and working well is a critical step in fighting your reactive work environment. It will stabilise your working environment so you can get ready for your next step on your journey to high plant reliability. And it increases your workforce productivity. The typical industry productivity or wrench time is somewhere around 30%. With proper maintenance planning and scheduling you can drive this up to 45% and the ‘Best of the Best’ achieve productivity levels up to 60%. Do you know your wrench time or how to improve it? Do you have any idea how much improving your maintenance productivity could be worth to you organisation? Want to know how to implement planning & scheduling successfully? Work Management is key to enabling your productivity, both the planning and the scheduling components of it. But without Defect Elimination you’ll never achieve high reliability. You will simply keep fixing reoccurring failures. You need to get rid of those failures through Defect Elimination and Root Cause Analysis. Research has shown that when you implement Work Management and a sound Preventive Maintenance Program you typically increase availability by about 5%. When you add Defect Elimination that triples to 15%, which makes Defect Elimination an essential element on your journey to high reliability. Firefighting? Never have time to focus on long term improvements? Some simple steps to start tackling defects can make a world of difference. Few things are as frustrating as your time being wasted, but most reviews of Preventive Maintenance programs show that some 30% of PM tasks can be deleted because they add no value. Those tasks are simply time wasters! Get rid of them. Essential to an effective preventive maintenance program is condition based or predictive maintenance, but do you know when to use these techniques? And when not? Think RCM is Too Complicated? Reliability Centered Maintenance (RCM) has a reputation in industry as requiring an excessive amount of effort and often yielding little value. I believe that the Road to Reliability™ is paved by Leadership. And sustained by Culture. Nothing will change, nothing will improve, without Leadership. As a Leader you need to set the vision and inspire your people you work towards it. One common problem is that many maintenance managers come up through the ranks with strong technical skills, but often lacking leadership and business skills. As a result our clients and students often struggle to define what good or great reliability would look like for their organisation. Let alone how to go about achieving a Reliable Plant. Do you have a roadmap to get you there? Let me help you by outlining how good maintenance and reliability looks and feels. How to achieve it and equally important – how to sustain it. There is more to reliability improvement than just the 4 Essential Elements. But my objective with the Road to Reliability™ framework is to help you focus on what truly matters. And for most plants, that's these 4 basics. Want to know how to improve reliability? Then download the Road to Reliability™ Roadmap below.